Donald Trump was at Trump International in Aberdeenshire yesterday to open the new clubhouse and make an exciting, if somewhat pre-emptive announcement. 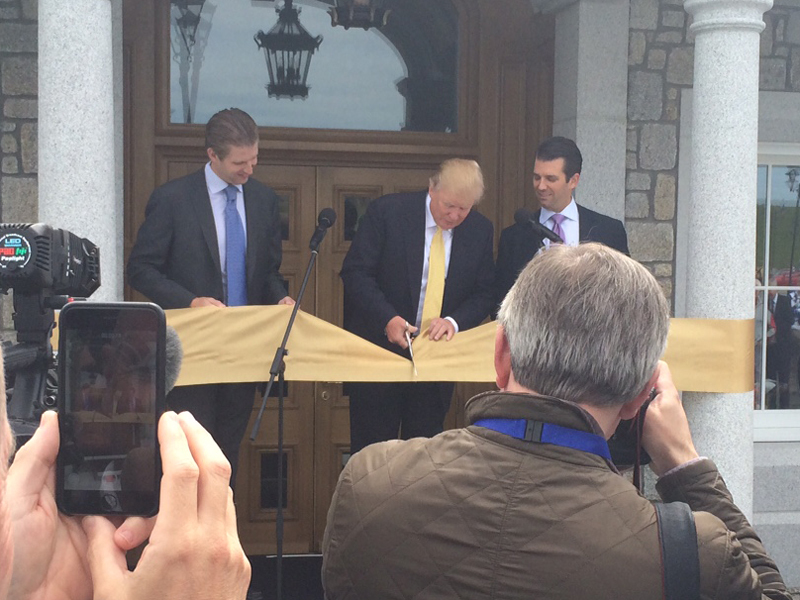 Just two days after cutting the ribbon on Turnberry’s newly refurbished clubhouse, Donald Trump had crossed Scotland to get the scissors out again yesterday at Trump International on the Menie Estate to the north of Aberdeen. 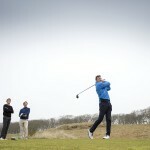 Mr Trump was in Aberdeenshire to officially open the new clubhouse at Trump International, and to tell the guests and press who had gathered for the event that the links, which opened in 2012, would be welcoming the Scottish Open in 2017 and that Scottish Open organisers want to bring the tournament to Trump International permanently. 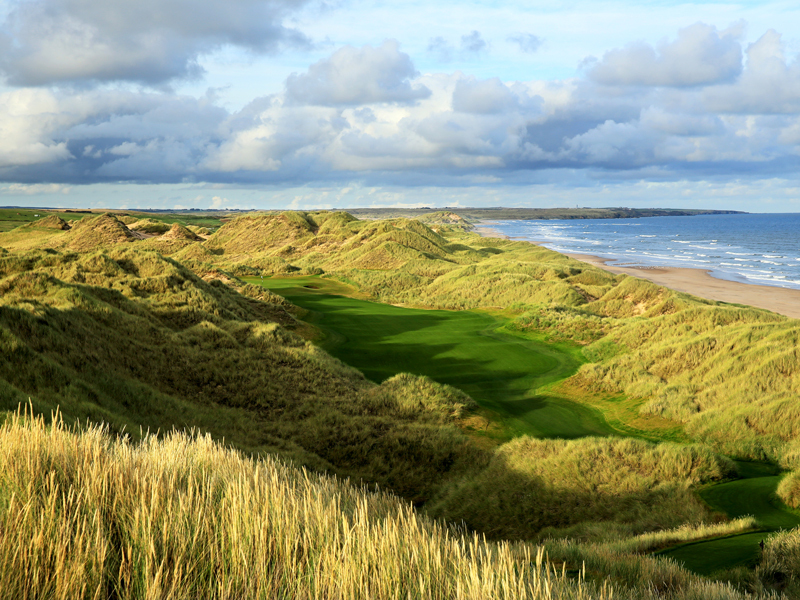 It looks likely that Trump International will welcome the Scottish Open in 2017 and probably again in 2019 and 2020. But it seemed yesterday that Mr Trump had jumped the gun somewhat with his announcement. Whether premature or not, the announcement that the Scottish Open is heading back to Aberdeenshire is great news for the North East and, following the success of last year’s tournament at Royal Aberdeen, it should prove to be a popular choice of venue. Having had the chance to play the course yesterday after the clubhouse opening ceremony, I can confirm the course will provide a spectacular and challenging stage for the prestigious competition. I’ve played once before, on the opening day back in 2012. But it was in dreek and blustery conditions, low cloud was obscuring some of the more dramatic views and the going was rather slow. One of the chaps I was playing with lost 12 balls in the first seven holes, had to borrow a couple of mine for the next two, then disappeared back into the pro-shop at halfway to buy a dozen more! So, I was keen to get out there again and see how the course had matured and, hopefully, to play it a little more sensibly. The first tee shot is a fairly intimidating one with sizeable dunes on the left side covered by ominously thick rough, and nothing too clever down the right side either. But the fairway is relatively generous and if you can block the trouble out of your mind, the hitting target is more than fair. This is a theme all the way round the track: trouble awaits a wayward shot, but you’re given a very decent amount of short grass to aim for. There are superb holes as you forge out southwards towards Aberdeen. The par-3 3rd where you emerge at the green to realise the North Sea is lapping at the back left edge of the putting surface, then the challenging par-5 4th with the Blairton Burn running all the way down the right side. I wouldn’t normally do this but I’ll just allow a short digression to point out that I managed an eagle three on this one yesterday, into the wind! The course turns after this hole and heads back towards the clubhouse. It’s another great feature of the track: On each nine, half the holes play out, the other half play in – so you have the wind helping and hurting for half of each nine. It’s a lot less demoralising than a classic out-and-back links where you might reach the furthest point and realise you have two miles straight into the teeth of a gale before you reach the 18th! The course has, indeed, matured since last I played it. Areas of rough have bedded in, the fairways have knitted seamlessly and the greens are just about perfect. Some of the putting surfaces feature significant borrows and, if the greenkeeper feels so inclined, he could make the test severe. Thankfully yesterday the pin positions seemed relatively forgiving and I faced only a few putts where I felt unsure what the undulations would throw at me. 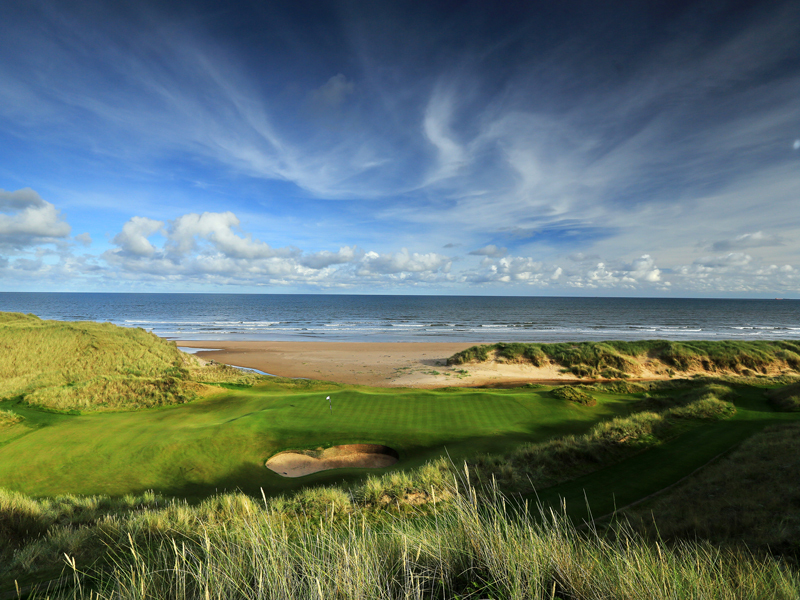 The dunes are towering and spectacular, particularly on the back nine. From the elevated tee shared by the 14th and 18th holes, the views north and south are breathtaking. It truly is a magnificent stretch of coastline. I also think the golf course provides wonderful access into the dunes for so many more people than would otherwise see it. The conservationists had a fit at the prospect of environmental damage caused by the course, but the layout sits sympathetically within the terrain rather than being thrust upon it. A word on the clubhouse. As you’d expect from Mr Trump, no expense has been spared. The windows are made by a company that specialises in casements for luxury apartments in Manhattan, the granite pillars either side of the main entrance are so heavy that special trucks were required to bring them in… in short, it’s all very high spec. But it’s also in keeping and it’s not, as you might fear, ostentatious. The building sits snugly in the landscape and is more concealed than conspicuous. There’s a hint of Scotland throughout with tartans and wood panelling, but it’s not excessive. And the pictures on the walls are not just of Old Tom Morris and Monarch of the Glen. I sat opposite a large print of Ben Hogan playing a drive in the LA Open of 1948 with a cigarette held casually between his lips: A rather cool image. There’s a pretty casual atmosphere throughout with staff laid-back rather than fawning. Something utterly world class at Trump International are the practice facilities. The grass driving range is what you would expect, but the short game area is immense. A number of small raised greens over an area of a couple of acres, each in the same condition as those on course, some with little pot bunkers, all with run off areas. Some tight lies, and other areas where the grassy is more fluffy. I think that even I could generate some sort of short game if I had regular access to a practice area like that. I think the pros will be blown away if, and when, the Scottish Open visits the Menie Estate. There may have been some teething issues during the construction process and the early years of Trump International. But, whatever you think of the man and his politics, he has built a golfing facility that stands out as one of the very best in the country, there’s no arguing with that fact.